Veteran character actor Duane Grey once shared some thoughts with us on performing in “Trader Tom of the China Seas” (‘54). In the earlier part of his career, Duane went under his real name of Duane Thorsen, playing badmen, sheriffs, ranchers and cowboys in numerous western features and TV shows, besides working in contemporary dramas. In addition to “Trader Tom”, Duane (as Duane Thorsen) also appeared in “Canadian Mounties vs. Atomic Invaders” (‘53). In his retirement, the 6'4" actor lived in Oregon until his death at 80 in 2001. Reflecting on his role of Hal in “Trader Tom of the China Seas”, Duane found serials interesting to work in, and talked of an incident that could have caused him serious injury. “Craziest things you see them do when you’re in this business. Republic had this small ship right on the soundstage with a wall built around it with water in it. There was a dumpster built up in the air in front of the ship, and it held hundreds of gallons of water. They’d open it up and the water would slam down on top of the deck. I was standing behind the helm in this particular scene behind the wheel. After letting the dumpster go a number of times, it tore the hatch cover off, came back and slammed up against the wheel I had and bent it. If I’d been standing there it would have taken me right off the deck to a 30 foot drop. It would have killed me,” Duane was later able to laugh. Timing is everything in life. 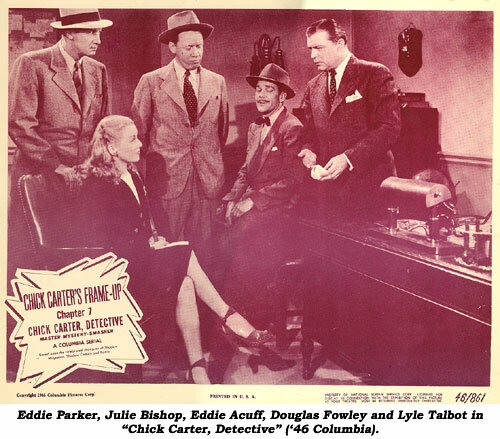 If the 1946 Columbia Pictures cliffhanger “Chick Carter, Detective” were the first serial I ever saw I would have spent my movie attending hours avoiding them. While it was being screened I would have gone into the lobby and done something instructive—like hitting on the teenage girl behind the candy counter. Quite simply, this was one of the oddest serials I ever viewed. Chapter one had a running time of 28 minutes. The subsequent 14 episodes ran either 18 or 19 minutes each. This would bring the total to just short of five hours. And what was the plot producer Sam Katzman felt justified this amount of screen time? I can tell you in one sentence: A valuable diamond is hidden in an artificial snowball which is sought by the police, newspaper men and assorted gangsters. That is the buggy whip that drives the actors through 15 not so thrilling chapters. The premise was wrong from the very beginning, starting with the casting of the title role. In the opening credits it’s stated Chick Carter is adapted from SHADOW COMICS. In the comic book, Chick Carter is a boy in his teens that liked to solve mysteries. In the serial he’s portrayed by the distinguished actor, Lyle Talbot, who was already in his 40s during the filming. A few decades later, I was the moderator at a film convention conducting one of the guest star Q&A celebrity panels. Talbot was one of my guests. He impressed the audience and myself with his memory of events that occurred 40 and 50 years earlier. During the panel no one in the audience asked him about this particular serial. So afterwards, when we were having a drink, I made the inquiry. He thought about my question, then replied, “I don’t recall that one!” I remember thinking to myself how merciful the human mind can be, blotting out the memory of something distasteful in our lives. He did remember appearing as Commissioner Gordon in “Batman and Robin” (‘49), a featured role in the Jock Mahoney serial “Gunfighters of the Northwest” (‘54) and the title role in “Atom Man Vs. Superman” in 1950. Talbot smiled as he told me in between scenes on that serial he and Kirk (Superman) Alyn would exchange cooking recipes. There were some oddly unique bits of actor and actress casting in “Chick Carter”. The main female lead was Julie Gibson. The Idaho born singer/dancer/actress was under contract to Paramount in the ‘40s and later freelanced in “Bowery Buckaroos”, “Ringside”, “Freddie Steps Out”, etc. Married to comedy director Charles Barton until his death in ’81, Gibson (also known as Jacqueline Wells; and even Diane Duval in "Heroes of the West" serial) died in Mendocino, California, August 30, 2001, on her 87th birthday. If Pam remembers anything at all about “Chick Carter, Detective” it is probably that the serial was nearly half over before she came on screen. Her character, Ellen Dale, did not even appear until Chapter 7. Then there is Charles King. Poor Charlie was a perennial movie villain. He never won a film fight in his life. Usually cast in B-westerns, he spent most of his time being beaten to a well deserved pulp by series cowboy stars like Buster Crabbe and Bob Steele. In these films he was always dirty, unshaven, mangy and disheveled. In “Chick Carter, Detective” he spent all his time in a tuxedo or suit and tie. A real stretch for one of our favorite bad guys. Another interesting member of the cast was Eddie Parker. 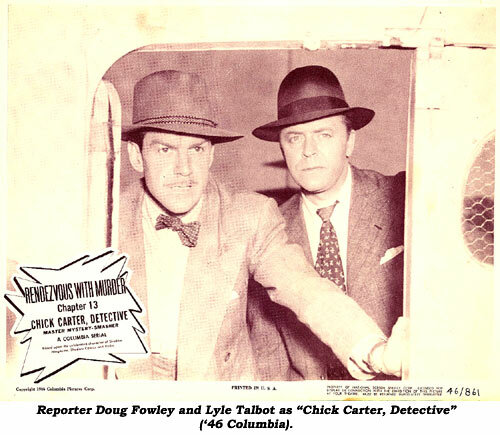 He played the part of a detective under the command of Chick Carter with lots of scenes throughout 15 chapters. The unusual thing is that Parker, one of the screen’s best stuntmen, was seldom trusted with speaking roles of more than a few sentences here and there. Often, he was assigned no dialogue parts. Conversely, he talked all the way through “Chick Carter” and could not be seen doing any stunts. To the true serial fan, there was much to exasperate them in this film. Such as the musical numbers. Five of them out of 15 episodes. They were just time consuming padding, but what made it doubly annoying was that they repeated one song at least 3 times! Then there were the bizarre cliffhanger endings. 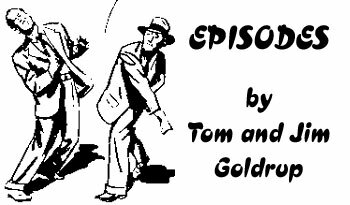 At the conclusion of Chapter 3, “Grinding Wheels”, a friend of Chick Carter, a supporting character in the story, is left in a car in front of a speeding train. In the beginning of Chapter 4, we find he has been killed! A peculiar facet of this serial was how infrequently the hero of the title was in any danger. Out of the 14 cliffhangers Chick Carter was involved in only three of them! Ironically, it’s the comic sidekick who is imperiled in the most cliffhangers, a total of 6. This role of the photographer helping a reporter (Douglas Fowley) was played by Eddie Acuff. 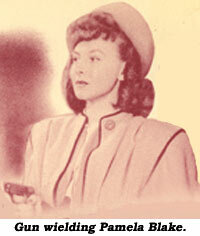 It was Acuff who scored so favorably with serial fans in the classics, “Jungle Girl” and “Daredevils of the West”. In another twist, the screenplay made it quite obvious Pamela Blake’s character prefers Eddie’s companionship to that of Talbot or Fowley. The strange plot continues… It had Douglas Fowley and Eddie Acuff fighting people that are not even bad guys! For instance, take the final minutes of Chapter 6. Its title is “Out of Control” and that is particularly appropriate to describe the actions of our two heroes. They believe the snowball with the diamond inside is being driven, mixed in with a load of garbage, to the city dump. They arrive at the dump as two city workers are about to release the full load of trash. Fowley and Acuff confront the two garbage collectors and tell them they want to search the refuse before they drop it down the incline and it gets mixed up with acres of other rubbish. The workers explain this is their last load of the day and after they dump it they’re going home. “Our heroes” try to climb on board the truck to start the search for the snowball when a fight breaks out between them and the garbage collectors. In another typically strange sequence, Chick Carter is talking to Charles King in Charlie’s office. A waiter enters and either puts something on King’s desk or takes something off of it. I have viewed the tape twice and I still can’t figure it out. Anyway, all of a sudden Chick pops him one on the jaw. This starts a fight that carries over into the nightclub area itself. Unexpectedly, several more waiters rush into the scene. Douglas and Eddie join in the melee and there is a full blown brawl. Remember, these are not crooks or gangsters but plain ordinary waiters. A little pugnacious perhaps, but still hardworking citizens. The bottom line is, it added nothing to further the plot as it was never even mentioned again. It was padding written by the increasingly desperate writers. It was all these little things that irritated me. In the cliffhanger of chapter 13, Acuff’s character is knocked down the side of a ravine and falls into a river. In the next chapter’s resolution we see a perfect stranger walking along the shore. He sees Acuff and stops to pull him out. Then the stranger proceeds to bawl him out for swimming in the river after dark! 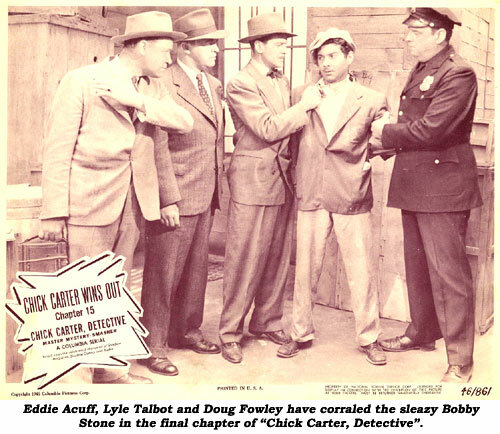 In another vexing situation, one of Chick Carter’s detectives is punched in the nose. The next scene shows him rubbing the back of his head! It’s my opinion if you want to see all the sound serials there is no great rush to view this one! The Iowa born (1915) Judd Clifton Holdren came to films with a small role as a politician in “All the King’s Men”, which won Oscars for Broderick Crawford and Mercedes McCambridge. By 1951 the handsome Holdren was the serial screen version of TV’s “Captain Video”. He became typecast as the penultimate ‘50s space hero in Columbia’s “Lost Planet” (‘53) and Republic’s “Zombies of the Stratosphere” (‘52), originally planned as another Commando Cody serial to follow “Radar Men from the Moon” with George Wallace but switched to Larry Martin at the last minute so as not to confuse it with “Commando Cody”, the 12 part Republic TV and theatrical “serial” in which Holdren did portray Commando Cody, Sky Marshal of the Universe. The first three “Commando Cody” 30 minute shows were filmed in February and March of ’52. 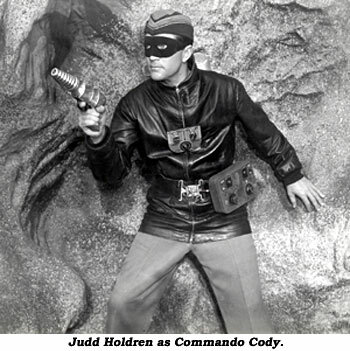 From April 14, 1952 – May 1, 1952, Holdren made “Zombies”, then completed nine more “Commando Cody” episodes in January ‘53. Holdren took his own life with a gun March 11, 1974. at only 58. In Ch. 2 of “Don Daredevil Rides Again”, as Ken Curtis escapes by hacking a hole through the side of the shack hanging precipitously on poles over a cliff, you can see bushes through the dislodged boards—but long shots of the shack reveal no trees or shrubs anywhere near.